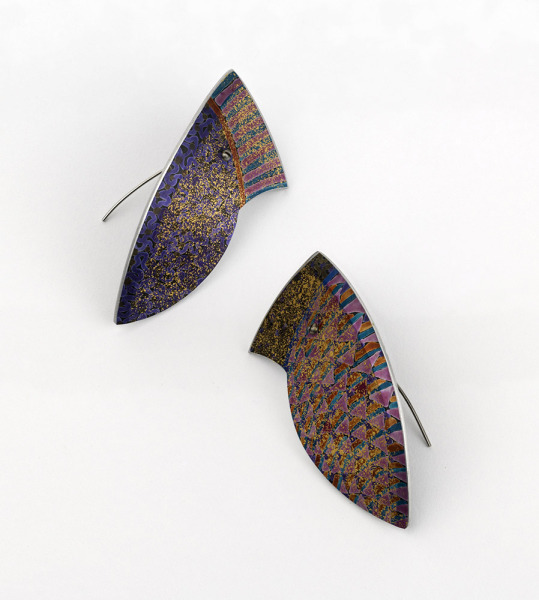 Pair of aluminium earrings, painted in colourful geometric patterns and splattered with gold. Thick anodised aluminium sheet, painted with aluminium printing inks, dyed to give a background colour and sealed. Pins and fittings from stainless steel wire, attached with steel screws and an aluminium tube. Surfaces splattered with gold size; embellished with 22 ct gold leaf, matted with pumice. Earrings, Jane Adam, 1991, Crafts Council Collection: J217. Photo: Todd-White Art Photography. These pieces emerged from the earlier painted and layered pieces - I wanted to give them a solid, stone-like feeling and the maximum possible richness. There was a group of maybe a dozen of these, before the idea developed into a range of production jewellery with a much simpler mottled surface. I was able to develop these thicker pieces with the help of a Craft Production Award from Greater London Arts.